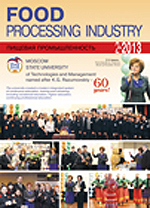 Publishing house «Food Industry» - Congratulations of RAAS President G. Romanenko with the Anniversary of Magazine "Storage and Processing of Farm Products"
The magazine makes a significant information contribution to the development of processing agricultural industries, promoting innovative ideas and knowledges. On its pages are always printed in-depth analytic materials, raises important problems, offers its solutions. Research results of academic and university science scientists, presented in the journal, provides the foundation for a new generation of food products. Published in the Journal of the theoretical aspects of the storage and processing of farm products, which are developed on the basis of biotechnological processes and methods for processing of agricultural raw materials and secondary resources, enable the creation of resource-saving technologies in food and feed additives for livestock. In the journal section "Physical and Chemical Methods of Farm Raw Material Processing" take an important place problems of improving the system of safety and quality control of raw materials and finished products in the present conditions, the creation of secure storage systems and high-performance control methods, including rapid identification of analyzers and test systems. Authors of publications are the most authoritative industry leaders, prominent academics and practitioners. Much attention is paid to fundamental and applied science, its effective connection with the production. Edition enjoys well-deserved reputation in the scientific community of Russian and foreign researchers, demand by business representatives and has broad prospects for the future. It is difficult to overestimate the tremendous role of the magazine in formation of young personnel for industrial enterprises, as well as for industry research. Wish the good health, happiness, further success to wonderful group of authors "The storage and Processing of Farm Products"!